Home / TallyERP.9 Lessons / How to Set Credit Limits in Tally.ERP9? 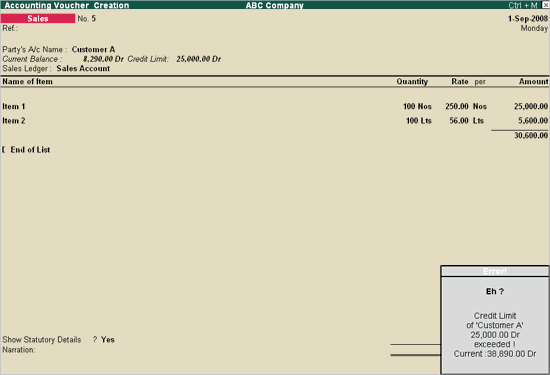 How to Set Credit Limits in Tally.ERP9? Credit Limit refers to the monetary limit agreed upon mutually by the seller and the buyer for trading purposes. Credit Limits can be specified for any Ledger account falling under the groups Sundry Debtors and Sundry Creditors. Ledger Accounts created under Sundry Creditors are also allowed for defining Credit Limits for the reason that there may be two-way trade between the parties i.e., you may sell to a Sundry Creditor and buy from a Sundry Debtor Accounts. Go to Gateway of Tally > Accounts Info > Ledgers > Create / Alter (under Single Ledger). Select the required party ledger from the List of ledgers to set credit terms. The single Ledger Alteration screen is displayed. You can set credit limits for both amount and period here. Select the required group of ledgers from the List of Groups to set credit terms. 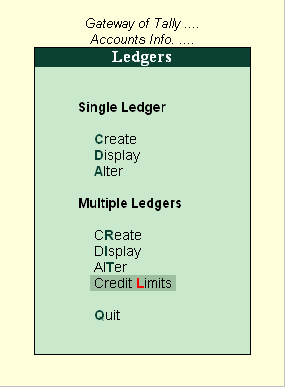 The Multi Ledger Limit Alteration screen is displayed. The list of ledger accounts under the selected group is displayed. You can now set credit limits for both amounts and periods here. Specify the amount of credit limit against the ledger account in this field. You can set the amount limits in foreign currency if required, for ledgers involving forex transactions. Credit period can be either specified in No. of days or the due date (for eg., 31.10.09) and are calculated from the Voucher date or Invoice date or the effective date, as applicable i.e., if only Voucher Date exists, it is considered as the effective date for calculation for Credit Days otherwise if effective date is specified in the Voucher, it is considered for calculation for due date. Abandon the current entry and obtain authorization to increase the credit amount limit in the Multi Ledger Limit Alteration screen. The significance of setting credit limits is that during voucher entry (or invoicing), the credit terms are automatically defaulted based on the configuration made in the ledger master. The current balance and the credit limit of the Ledger accounts are displayed in the Order and Invoice entry vouchers to ascertain the amount permitted or acceptable.